New data is drilling in what the market has been anticipating for some time - that residential property price growth, including in key capital cities, is set to soften. Sydney’s median house price is forecast to flatten over the next three years, following Australia’s most notorious property price rise, according to QBE’s Housing Outlook report. “Prices are forecast to soften through the three years to 2019, which is likely to be positive for housing affordability,” QBE Lenders’ Mortgage Insurance chief executive Phil White said. It will come as welcome relief for some after the city’s median house price soared by an estimated 56 per cent over the last four years, or around $371,000, according to QBE’s estimates. In comparison, QBE forecasts that Sydneysiders will pay a median of $1,050,000 in 2019, just $3,300 more than they would today. Mr White said the research demonstrates the changing nature of Sydney’s property market, as reliance shifts from houses to units to meet the needs of a growing population. “It raises timely questions about whether our dwelling commencements, especially in Sydney, will have us on track to meet short, medium and long term population challenges,” he said. 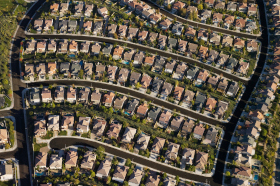 While population growth in Melbourne is causing a current dwelling shortage, QBE said this will be remedied by this year’s peak completion rate, seeing the median price of houses and units decline 0.6 per cent and 9 per cent respectively over the next three years. Median unit prices are forecast to fall in all capital cities, with the exception of Canberra, by an average of almost 5 per cent. Compared to Sydney and Melbourne, Brisbane will be home to the most significant house price growth, with the median forecast to increase by 6.5 per cent. Mr White said population growth and planning will be the most important determinant of housing prices.